Hrmmm... those trees seem to be growing at odd angles. I mean the right two trees aren't exactly natural, but whatever. The light rays are pretty cool. I loved the first verison but this is just great too, I wish I could do something like that. oooh! ITS IY!! ^^ sooo good i love it! It is very beautiful, as all your work is. I love the little fireflies. that anime creature is blocking the beautiful forest, doesn't belong there. Maybe some woodland creature would be better. its great... a real eye catcher...inuyasha!! Inuyash is the shiz. i dont get why their manga isnt backwards. The background is great on this one. I once had a dog named Annie Mae and was quite fond of her. *shreaks* i LOVE Inu-Yasha! thats realy good 2! i love inyasha he is sooo kool i love the way you made the pic. InuYasha- A half human / half dog daemon from the fuedal era of Japan. Gender - all male. And Inuyasha is one of the least feminine looking of the anime characters. Inuyasha! I am obsessed now. Beautiful drawing! Keep up the good work! woah! thats an awesome drawing! I happen to love the show inuyasha which is kinda odd for a girl according to my friends but yeah you have some real talent! :) good job! I should show this 2 my best friend Vanessa from my school. Great drawing!!! The lighting is really good too! 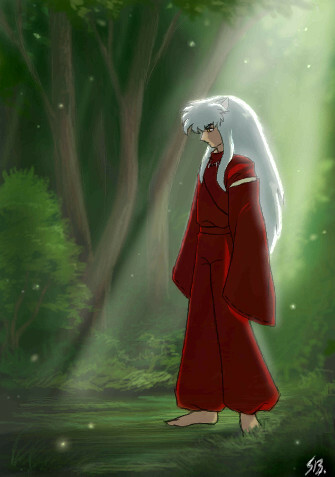 i hav to comment this cause inuyasha is so kool great job drawin him!!!!!!!!! Okay, just gotta say.. if i hadn't said it b4, Inuyasha doesnt have a face like that, plus the foot looks a bit off to me. EDIT; But it still looks okay if you dont say it's supposed to be Inu.